If you search on "George H. Burgess +army" using Google, (5-15-04), you will find about 22 links. Only one of them appears to be relevant, and I have some doubt about it. Queries 1996 for Tioga and Bradford Counties in PA This page on the Tri-Counties Genealogy & History Site website, by Joyce M. Tice, offers this brief entry which probably refers to Burgess, the aviator. 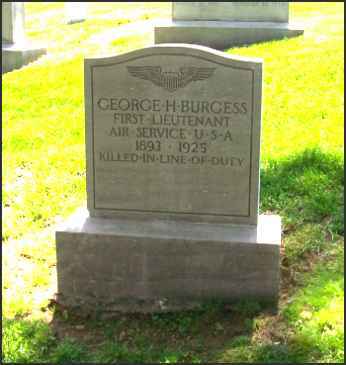 "George H. BURGESS March 3, 1893 in Retta, Susquehanna, PA."
You can access the page by clicking on the title above.